Australia’s first pill-testing trial, held at Groovin the Moo in Canberra on Sunday, has been hailed a success by the government of the Australian Capital Territory (ACT), with around 130 festivalgoers believed to have used the facility. The trial was facilitated by the STA-SAFE Consortium, a group backed by the NGO Harm Reduction Australia, which was given the go-ahead by festival promoter Cattleyard Productions late last week. “This was the first pill testing trial to be carried out in Australia and enabled people who decided to take drugs at the festival to make more informed choices. Pill testing analyses the contents of drugs and can help individuals avoid taking unknown and potentially harmful substances,” says ACT health minister Meegan Fitzharris. According to STA-SAFE, the majority of drugs tested were MDMA, although several samples also contained potentially dangerous adulterants – mirroring a similar trial at the larger Secret Garden Party festival in the UK in 2016, where 80 “substances of concern” were identified, including insecticides and anti-malarials. Of particular concern at Groovin the Moo (GTM), says Fitzharris, were a “novel NBOMe” – a new family of hallucinogenics nicknamed ‘N-bombs’ – and n-ethylpentylone, a substituted cathinone believed to be responsible for a number of deaths. It was the first time both drugs had been detected in the ACT. The trial also found traces of toothpaste, spray paint and a muscle rub, arnica, STA-SAFE’s Dr David Caldicott tells ABC Radio Canberra. A statement from STA-SAFE says its service was “very well received by festivalgoers, and the trial will provide a very important range of information which will be provided to key stakeholders in the ACT”. Burning Man CEO Marian Goodell has paid tribute to Larry Harvey – the festival’s co-founder, as well as a “landscape gardener, a philosopher, a visionary, a wit, a writer, an inspiration, an instigator [and] a mentor” – who passed away on Saturday aged 70. Harvey co-founded the festival – a countercultural gathering in the Black Rock desert, Nevada – in 1986 with his friend, Jerry James. The event has since grown from a three-day, 80-person ‘zone trip’ to an eight-day event attended by around 70,000 people, including Silicon Valley CEOs and other business leaders. Harvey suffered a stroke on 4 April, and died “peacefully” in San Francisco at 8.24 on 24 April, says Goodell. She describes Harvey (pictured) as a “passionate advocate for our culture and principles that emanate from the Burning Man experience in the Black Rock Desert. “As he told one of us recently, Larry liked to create ‘scenes’ that made people consider the world in a new way. He was extraordinarily successful at doing just that. “Burning Man culture has lost a great leader and an inspiring mind. He adeptly interpreted the manifestation of what became a movement. I have lost a dear friend who I’ve known, loved and worked beside for nearly 22 years. The loss of his presence in our daily lives will be felt for years, but because of the spirit of who he is, we will never truly be without him. Friend Stuart Mangrum adds that the late Harvey saw Burning Man “as one of the only viable alternatives to the consumerist mainstream”. “For Larry, building a framework where people could create and experience authentic culture, rather than simply buying it off the shelf, was the wellspring of Burning Man’s success, and the key to its future,” he writes. Burning Man 2018 takes place from 25 August to 3 September. History was made in Saudi Arabia last Wednesday when a woman singer performed before a mixed (as opposed to all-female) audience for the first time. Egyptian singer Nihad Fathy, backed by Egypt’s National Arab Music Ensemble (AME), played to a 2,500-strong crowd at the King Fahad Cultural Center in Riyadh on 25 April. The show marked the latest chapter in Crown Prince Mohammed bin Salman’s Vision 2030 initiative, which, among other aims, hopes to develop a domestic live entertainment industry in the conservative Islamic kingdom. Last September, the General Authority for Entertainment – the body tasked with driving growth in the entertainment sector – announced a US$2.7 billion fund with which it hopes to attract international partners, and said in February Saudi Arabia will host 5,000 shows in 2018, including “some of the biggest names in global music”. Live music contributes a greater share of music industry revenues in the Middle East and North Africa (MENA) than elsewhere in the world – 90%, compared to around 65% worldwide – and foreign investment is pouring into the Saudi Arabia’s MENA neighbours Israel, Dubai, Abu Dhabi and Qatar. Commenting on the AME show, Saudi culture minister Awwad Alawwad – who initiated the event with his Egyptian counterpart – says: “It is a momentous occasion for Saudis. This event is a realisation of one of the main concepts of Vision 2030 […], which is social and cultural reform through inclusion and participation. This is a transformative moment in the evolution of Saudi Arabia into a more vibrant economy and society. In March 2017, Saudi capital Riyadh hosted its first concert since 1988 – music is generally considered sinful (haram) by the Sunni kingdom’s religious authorities – marking the beginning of a major social shift in country. Bucket hats at the ready: hot on the heels of Cool Britannia, Britain is getting yet another Britpop-themed festival this summer, in the form of a new one-day Shiiine On event at Genting Arena in Birmingham. 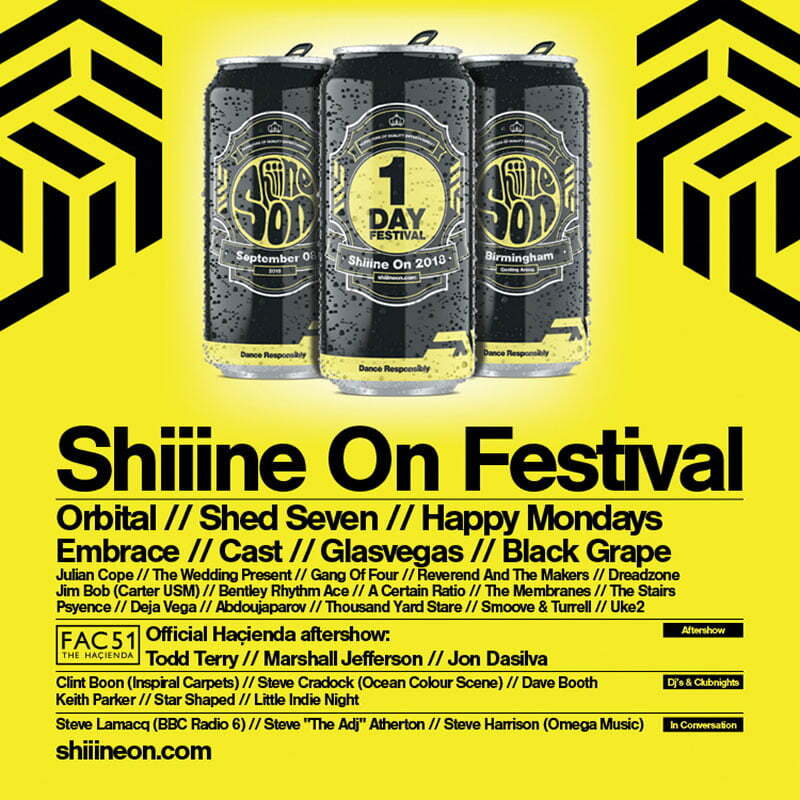 Complementing the flagship Shiiine On Weekender at Butlin’s in Minehead, the one-day Shiiine On festival will take place at the 16,000-seat arena on 8 September 2018, and feature performances from Orbital, Shed Seven, Happy Mondays, Cast, Black Grape, Embrace and more. The launch of the festival follows January’s news that famed outdoor venue Knebworth will this summer host Cool Britannia, a three-day ’90s-themed event also hosting sets by Happy Mondays, Embrace and Cast, along with the Lightning Seeds, Dodgy, Toploader and Ocean Colour Scene. Cool Britannia takes place around a week before Shiiine On, from 31 August to 2 September. Tickets for Shiiine On are on sale this Friday (4 May) via the Ticket Factory, priced at £66.65 for a standard ticket. Anthony Makes, formerly lead promoter at AEG-owned Bowery Presents, has joined Live Nation’s US Concerts division, as the company expands its team in New York. Makes, who had been with Bowery for more than a decade, has been named president of New York, while longtime Live Nation booker Jason Miller becomes executive vice-president, New York. The team report to Alan Ostfield, Live Nation’s president of US Concerts for the north Atlantic region. AEG finalised its acquisition of a stake in New York promoter/venue operator the Bowery Presents in January, less than a month after Live Nation formed a joint venture of its own, Mercury East Presents, with Bowery co-founder Michael Swier, adding famed venues the Bowery Ballroom (575-cap.) and Mercury Lounge (250-cap.) to its stable of New York properties. The New York live music market – the world’s busiest – is hotly contested between the two companies: both Live Nation and AEG promote major festivals – Governors Ball and Panorama, respectively – on Randalls Island, while Madison Square Garden is central to the ongoing ‘booking war’ between AEG and Live Nation-aligned Azoff MSG Entertainment. Live Nation produced or promoted from than 2,700 events in the New York region in 2017, with a combined audience of nearly six million. A spokesperson for Abba has said there are no plans for the Swedish superstars to go back on the road – in person, at least – following this morning’s surprise announcement of new music. The two new songs – one of which is titled ‘I Still Have Faith in You’ – will be performed by Abba’s “digital selves” in an NBC/BBC television special, set to be broadcast in December. The band last performed together in person in June 2016 at a one-off private event in Stockholm. Speaking to IQ, Abba spokeswoman Görel Hanser says there “no touring plans whatsoever”, with the Abbatar tour providing an opportunity for fans to “remember Abba as they were”. Another source close to the band echoes Hanser in saying, “it’s a shame, but they absolutely won’t tour again”. The Abbatar project was revealed in Brussels earlier this month, with Ulvaeus promising the TV special will be a “global television moment” to rival the Eurovision Song Contest. The project, a partnership with Universal Music Group and former Spice Girls manager Simon Fuller, is being billed as “a groundbreaking venture that will utilise the very latest in digital and virtual-reality technology” that “enable a new generation of fans to see, hear and feel Abba in a way previously unimagined”. Abba have sold more than 400 million albums but – in contrast to many of their contemporaries – have resisted offers to reform. Aside from the private party in 2016, the band have not performed live since 1986. Their final full concert tour was 1979–1980’s Abba: The Tour, which visited arenas in North America, Europe and Asia. According to Billboard, total gross from five typical shows in North America – Pacific Coliseum (13,499 tickets) in Vancouver, Concord Pavilion (8,096) in California, Milwaukee Auditorium (6,120), Boston Music Hall (4,200) and Maple Leaf Gardens (16,400) in Toronto – was US$441,482, from 48,315 total tickets sold. For comparison, 2017’s top tour, U2’s Joshua Tree 2017, grossed an average of $8.32m – per show. After almost two years of false starts, Australia’s first-ever pill testing trial will go ahead at Groovin the Moo in Canberra this Sunday. However, those legal hurdles have now been cleared, and pill-testing consortium Safety Testing Advisory Service at Festivals and Events (STA-SAFE) will run the service at this weekend’s event at the University of Canberra, according to ABC. A recent review of Australian drug policy, ‘Worth the test?’, concluded pill testing – which is in force at festivals in the UK, Austria, Spain and the Netherlands – could be a vital part of wider harm reduction strategy. “It is important to focus on prevention, public awareness campaigns and education to shift cultural attitudes, so that use of party drugs is identified as a public health issue rather than a criminal one,” writes report author Andrew Groves. The announcement has met with a mixed reaction in Australia, with the Liberal Party’s Jeremy Hanson, shadow attorney-general for the Australian Capital Territory (ACT), saying the move will encourage drug use. “It’s essentially saying we’re the pill-popping centre of Australia, come to Canberra because this is where you can get your drugs tested,” he says. However, ACT health minister Meeghan Fitzharris, who backs the trial, says the service is designed to minimise harm rather than encourage drug-taking. “When people have more information available to them about what it is in the pill that they may choose to take, many of them may choose not to take it,” Fitzharris comments – a position borne out by similar testing in Britain. Jon Drape, whose Ground Control Productions company works with Kendal Calling, one of the festivals where pill testing is offered, told IQ in 2017 drug testing is a “no-brainer”, as around a quarter of those who tested their drugs opted to bin them after discovering their content. Kilimanjaro Live, Glastonbury Festival, Eventim UK and Coda’s Alex Hardee were among the live business winners at last night’s Music Week Awards 2018 in London. Kili took home the Skiddle-sponsored award for live music promoter (company), while Hardee was named best live music agent (individual). Eventim was honoured as best ticketing company, and Glastonbury as festival of the year. Ed Sheeran’s manager, Stuart Camp, meanwhile, took home the gong for manager of the year, while the 275-capacity Boileroom in Guildford was named best grassroots venue. The annual event was this year attended by more than 1,200 guests at the Grosvenor House Hotel in Mayfair. The Armory, the newest live entertainment venue in Minneapolis, will feature “booking and programming support” from Live Nation, the company announced today. The 8,400-capacity Armory – formerly, true to its name, a Minnesota National Guard armoury – reopened in December 2017 after an extensive renovation that introduced, among other things, a modular, scalable floorplan able to accommodate a variety of live events, including concerts and sporting and corporate events. The venue will be open to all promoters, although Live Nation says it will tap into its “vast array of touring artists” to bring Minneapolis “even more incredible shows”. Upcoming shows at the Armory include Slayer on 24 May, Dua Lipa on 24 June, Greta Van Fleet on 3 July and 5 Seconds of Summer on 9 September. You are currently browsing the IQ Magazine blog archives for April, 2018.